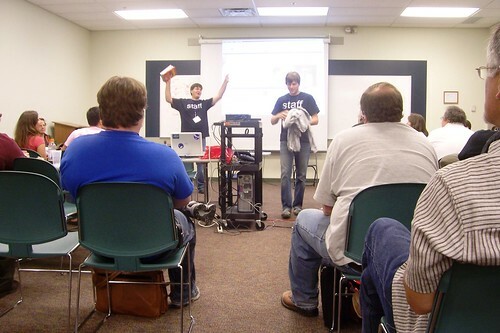 PodCampOhio — what a massive meet up and sharing of some super information about podcasting, webcasting, and wordPress ideas & how-to’s yesterday in Columbus Ohio at the ITT Technical Institute! The support and sharing of all this great info — for F*R*E*E! Generous people: After Kenny Ruffin (music/video/photography/web) Media artist won the Soccer Moms Myth book as a doorprize, he was so nice to give it to us to read. Thanks! Great Sessions: Dave Jackson Podcasting in Plain English was wonderful and a great intro for those who are still beginners. He’s a great presenter and –bonus — he’s from Akron. He talked about Blubrry pronounced blueberry , so I’ll have to check out that and libsyn as a hosting place too. I didn’t realize that there was a media host (server for the media), a webhost (for the blog/website) , the media (actual podcast) and that iTunes was where people went to find it. All was recorded and will be posted at PodCampOhio’s Podcast by CoefficientMedia. Talkshoe for hosting. BlogTalkRadio for recording and hosting. Audacity for recording andÂ editing. GarageBand for recording and editing. Skype’s Pamela or FreeConferenceCall for recording. iTunes for distributing the RSS. Mitch Cantor from StudioNashVegas (marketing communications, graphic design agency) posted his slides at SlideShare.net: WordPress 101 and WordPress 201 . By the way, he drove all the way from Nashville to Columbus to deliver the presentation while his wife is 8 1/2 months pregnant! We were all expecting the phone to ring & Mitch to take flight at any moment. Best of luck to you and your wife with your new baby, Mitch! I like your business card too – very creative. Heard quite a bit about Blip.tv as a f*r*e*e host for audio or video. Another place I’ll need to investigate. 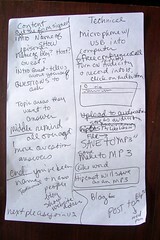 There are two challenges for me: organizing the content and organizing the technology. PodCampOhio gave me some great ideas for both, but lunchtime with my friends helped my plan to really come together into an actionable to do list. We’re all planning to get together for “A Podcast on the Pontoon” in about a month to see how we’ve progressed in a quest for learning to podcast with confidence. I’m so honored you enjoyed my sessions. Thanks for coming; I enjoyed presenting as much as I hope everyone enjoyed the sessions. Thanks for sharing. I both enjoyed it and got a lot of great info from your presentation!! I love listening to Dave Jackson’s School of Podcasting’s Morning Announcements. I’m glad you got to hear him talk about podcasting. From your notes, it looks like you have a plan, and I think I’ll look forward to hearing your show!